Your quest to gather the five Power Stones in the Adventure Mode in Mario Tennis Aces will eventually lead you to the historic Mirage Mansion, where, after defeating Boo, you will need to work out how to beat the Reflection Room. With Mario and Toad deemed traitors and enemies, the creepy mansion’s magical mirrors are more than happy to lock you in this dark room until you manage to unravel its mysteries so that you can make your escape. 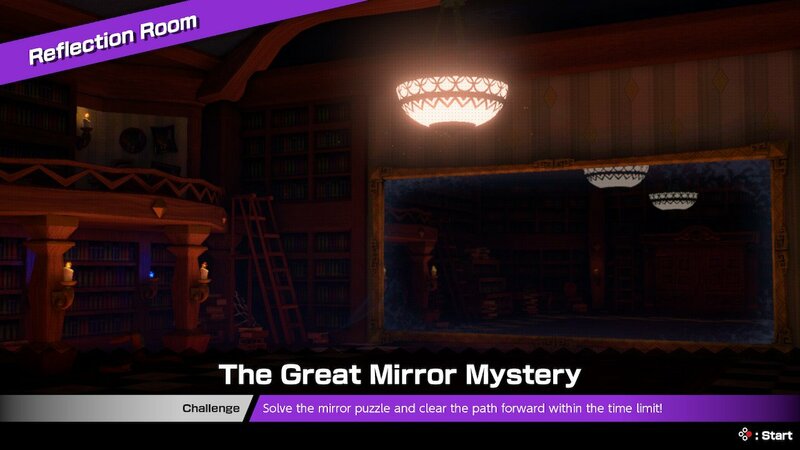 The Great Mirror Mystery that awaits you in the Reflection Room is, as it sounds, a mirror puzzle. But, what makes it particularly tricky is that the game never explains what you are required to do to overcome it. Thankfully, it’s simpler than it first appears. The way to work this is out is simple, in that slamming the tennis ball into one of the ethereal circles will not only make it briefly show a colour as well as produce a sound. You will want to look for the golden colour and the higher-pitched ding to spot the correct circle, and, once identified, you will need to build up your Energy and aim a Zone Shot in its direction. If it’s not the right circle, it will produce a purple colour and a lower-pitched sound. More and more circles will appear in the first phase, but the way to solve the puzzles remains the same. Eventually, you will move on to the second phase of the mirror puzzle inside the Reflection Room. This should be easier to work out what to do at first glance, but, if you need a few pointers, you will need to hit a tennis ball into one of the cogs that are whirring their way around the clock face that’s appeared. Once you hit a gear, a star will appear that will let you perform a Zone Shot. What’s important here is that you need to repeatedly perform Zone Shots to take out the gears consecutively. Take too long and they will simply reappear, so take your time to carefully aim your Zone Shots – targeting slightly ahead of the faster cogs to make sure that you don’t miss them. And, well, that’s it. Good luck! aim in front fo the fast moving cogs in the second phase. If you aim at their center, you’ll miss them since they move so fast.